This three week trek leads you through the mountain valleys of the Khumbu region, the Thame Valley, the Gokyo Valley, and the Khumbu Valley (Mt. Everest). 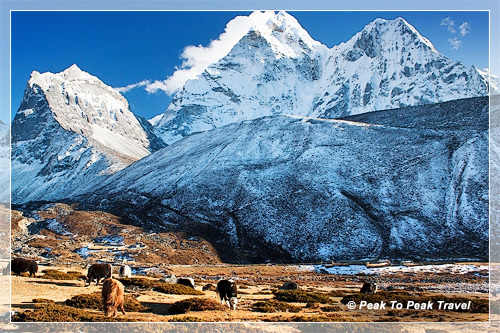 This is the grand tour of the world renowned Khumbu region. The Peak to Peak Trek is rated as a strenuous trek which includes the Renjo Pass at 17515 ft., (a great way to approach Gokyo) and Cho La pass at 17782 ft., the Gokyo Ri 17520 ft., the summit of Kala Pattar 18448 ft., and the Mt. Everest Base Camp 17500 ft. This trek is designed for the physically fit and experienced hiker. 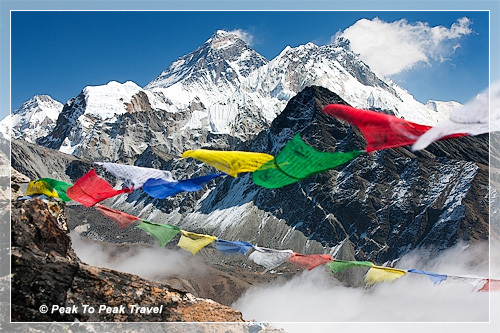 Panoramic view of the over 8000 meter peaks such as Cho-Oyu (8201 m.), Makalu (8463 m.), Lhotse (8516 m.) and Mt. Everest (8850 m.) are seen from the pass and the popular summit point of Gokyo Ri. 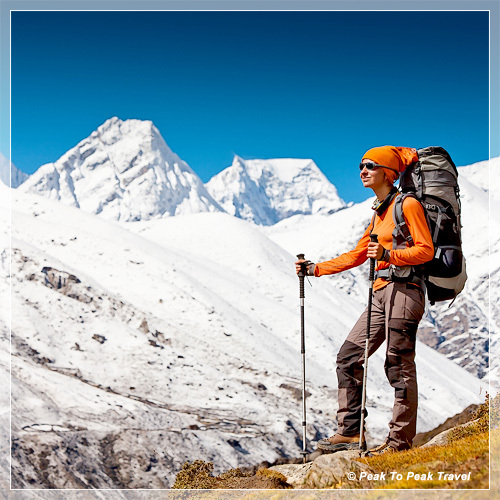 The route of Peak to Peak Trek is fairly isolated, and it is not used by many trekkers. This trek takes you through Sherpa villages and sacred monasteries. You will experience Sherpa culture and their life in the Khumbu region. With the combined guiding knowledge of Dawa and Pasang Sherpa and their well trained staff, you will be well taken care of. Peak to Peak Trek is a well organized trek. Their high altitude pack animals, yaks, will be used for loads. Camp will be set in the Himalayan wilderness by our Sherpa crew, and warm hearty meals are served three times a day by our cooking team. The number of trekkers is limited to a maximum of 14 and a minimum of 4 people. Join us for this journey through the Sherpa villages, the high mountain valleys, snow covered passes and magical views of the world’s highest mountains in the high Himalayan region of North Eastern Nepal. Day 5: Fly into Lukla (9283 ft.) We will fly (35 minute) from Kathmandu to Lukla and then continue our trek to Phakdingma (8700 ft.) where we will camp overnight. This is about a 4-6 hour trek through the Sherpa village of Chuplung, Ghat and Phakdingma. We will see beautiful Mani walls, the Dudh Koshi River, and mountains. Day 6: Trek from Phakding to Namche Bazaar (11300 ft.) We will trek to Namche crossing the Dudh Koshi river about six times. Views from the suspension bridge are breathtaking. Mountain Goats and the Nepali national bird, Danphe, are seen in the Sagaramatha National Park. We will stop at Jorsale, about a half hour walk from the Sagaramatha National Park check post. After lunch we will continue to hike to Namche by climbing the Namche Hill. The Namche Hill is about a 2 hour climb and we will gain about 2600 ft. in elevation. It is a beautiful and hard hike. Day 7: Acclimatization day, visit the Sherpa Museum and Everest View Hotel. Day 8: Trek to Thame (12533 ft.) This is a 4-6 hours trek. Lunch will be served at the halfway point in Thamo village. Thamo is an old sherpa village. The Sherpa village of Thame is clearly seen from here and is about an hour and half trek from Thamo. During summer and early fall the Sherpa people will be harvesting their crops. Day 9: Trek from Thame to Marulung. This is a trek through a remote Sherpa village and Himalayan meadows. We are in the high Himalayan wilderness. Day 10: Trek from Marulung to Tsorelmo: We will continue to gain altitude as we trek through a somewhat isolated area. Very few trekkers are seen on this trail. If needed, we will spend one more night here for acclimatization. Most trekkers go to Gokyo Valley from Tsorelmo. Day 11: Trek to Gokyo (over Ranjo pass 17515 ft.) The pass can be icy or snowy. Views from the pass are amazing. Save some time to spend at the top for photos. This is one of the challenging days as we are in the thin air and the trails may be very difficult (depends on the weather). Day 13: Trek Gokyo to Dragnag (15387 ft.) We will cross the Ngozumpa Glacier moraine and camp at Dragnag. This is a short trek. Day 14: Trek to Dozongla (15846 ft.) via Cho La pass (17782 ft.) The Cho La pass can be icy and snowy as well, we will use an ice axes and ropes if needed. We will have a great view of Mt. Amadablam, Mt. Lotse, Mt. Pumori and the Khumbu glacier, and a close view of Mt. Everest from the pass at Khumbu Valley. If the weather does not allow us to cross the Cho La pass we will take the alternative route via the Sherpa village of Phortse. Day 15: Trek from Dozongla to Labuche (16175 ft.) We hike from here to Labuche, another popular camping and lodging place on the way to Mt. Everest Base Camp. The views of Mt. Everest, Mt. Nupse and Mt. Pumori are spectacular from here. Day 16: Labuche to Kalapatther (18448 ft.) This is a beautiful hike. You will see Mt. Everest just a few miles away from the top of Kala Patter. Kala Pattar is known as the best place to see Mt. Everest. We will hike back to Gorakhshep for overnight camp. Day 17: Trek to Mt. Everest Base Camp. Today we explore the Khumbu Ice Fall and the Mt. Everest Base Camp. We will camp at Gorakhshep one more night. Day 18: Trek to Dingbuche. 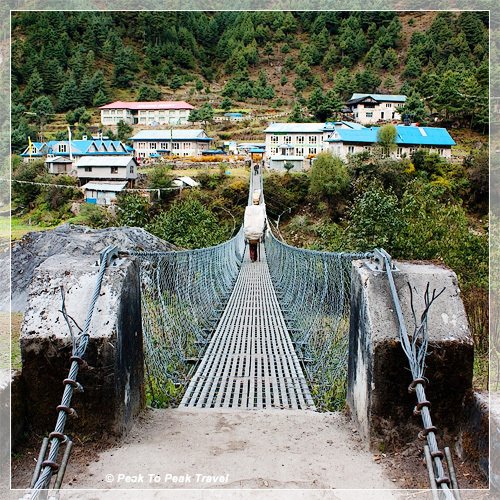 This is a beautiful hike through the Khumbu Valley. Dingbuche is the highest point in the Khumbu region where they grow potatoes and barley as crops in summer. Day 19: Trek to Tangboche. We will camp close to the sacred monastery of Thyngbuche and visit it in the morning. From here on it is an easy trek to have fun, say hello to the Local Sherpa people, get connected, and share your adventure. Day 20: Trek to Namche. Yeah!! We are back in Namche and its time to party. Visit Dawa’s friends, say Tashi Delekh and have some Sherpa tea. Day 21: Trek to Phakdingma. Day 23: Flight back to Kathmandu. 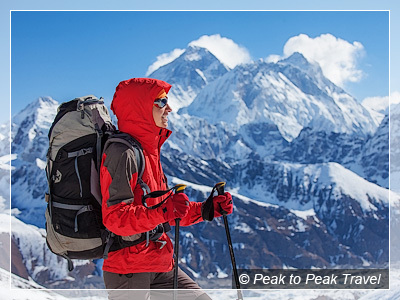 The cost of Peak to Peak Trek is $2995, Single Supplement (for private rooms and tents) is $450. The Trek cost includes trekking permits, the Sagaramatha National Park fee, Meals (breakfast, lunch, and three course dinner prepared by our cooks using local organic produce), tea house lodging (if needed), staff salary, four nights hotel in Kathmandu, one day sightseeing in Kathmandu, round trip airfare from Kathmandu to Lukla and airport transportation. If we need to use the tea house we will choose the best available tea houses/lodges. Travelers are responsible for round trip airfare from the USA to Nepal (Singapore Airlines has recently reduced their round trip airfare between Denver and Kathmandu with a connection in either Los Angeles or San Francisco to just $1600), mandatory evacuation and travel insurance, bottled drinks and alcoholic beverages, meals and transportation on free days in Kathmandu, personal shopping, tips for staff, visa fees, and airport exit fees. "The Khumbu and Gokyo-Ri have been on my "must do" list for over a decade. 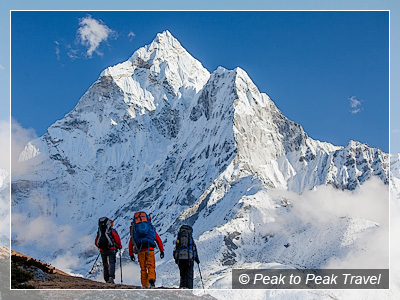 Dawa Sherpa and Peak-to-Peak Travel fulfilled my dreams and a whole lot more. I thought that the 10-day trek would be the highlight of the trip. Well, was I wrong! The highlight was spending our time from start to end with Dawa, Pasang, and all their Sherpa friends who call this wonderful place their home. Some of the photos on Peak-to-Peak's website are from our trip, and they aren't half as spectacular as being there! The trip vastly exceeded my expectations. No doubt one can manage their own trek. What I didn't realize until going with Peak-to-Peak travel is that having someone who grew up in this region, and who now lives in the US, adds a very special cultural flavor to the experience that makes one feel at home. Dawa seems to know everyone in the region, and he knows what to do to get the best rooms and food at each of the tea houses we visited. I can't wait to get back to Nepal!"